Well googly is the kind of unexpected delivery in a leg spin bowling which pitches in and around the off stump line for a right handed batsman and moves into the stumps or the batsman after hitting the pitch. So how do you bowl this kind of googly ? Well the gripping for a googly will be similar to the way you grip for the leg break. In below picture you can see very clearly the ring finger resting on the seam pointing in down direction, the ring finger can also be called as spinning finger. The middle and index fingers clearly rested on top of the seam with a comfortable distance, and finally the thumb can be switched on or off pointing in up direction. 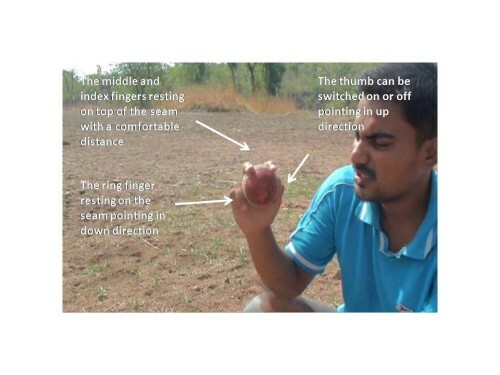 Since the ring finger plays the key role in rotating the ball from right to left in both googly and leg spin bowling it is called as the turning or spinning finger. And the grip shouldn’t be too tight or too loose it should be comfortable and depends on individuality. 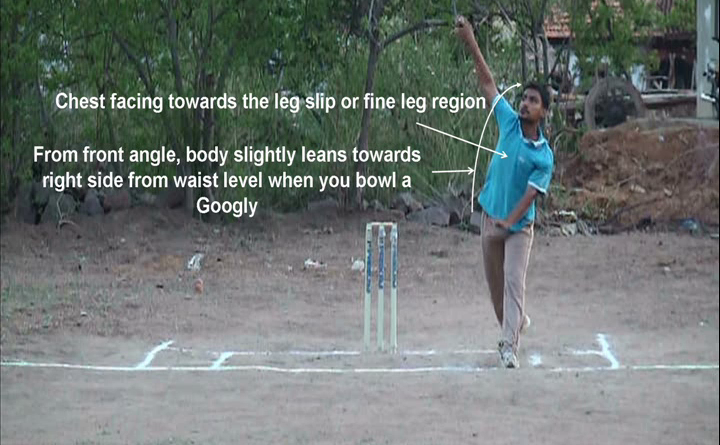 Well to bowl this kind of googly the position of arm has to be raised at an angle of more than 60 degrees, the position of arm will look like a high arm action. 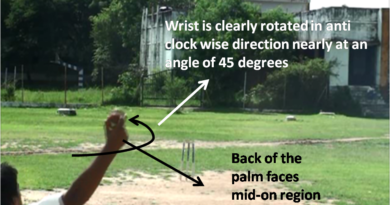 And the wrist has to be rotated from basic 0 degrees to 180 degrees such that the back of the palm will have to face the batsman. To bowl this kind of googly the direction of front leg has to face the batsman or may be some times can face towards first slip region. Because of high raise of arm, the direction of front leg has to be adjusted accordingly. And the position of body or chest has to face towards the leg slip or fine leg region so that the ‘raise of arm’ which is required for this type of googly can be adjusted accordingly. And you can see in the picture the body slightly leans towards right side from waist level. After gripping the ball, now try to rotate the ball in the direction of leg slip region so that it moves into the batsman after hitting the cricket pitch. To make sure to rotate the ball in the direction of leg slip region, try to concentrate on the gap between the middle and ring fingers. Now try to release the ball from back of the palm (facing the batsman) such that, exactly the releasing point has to be from the gap maintained between the middle and ring fingers. 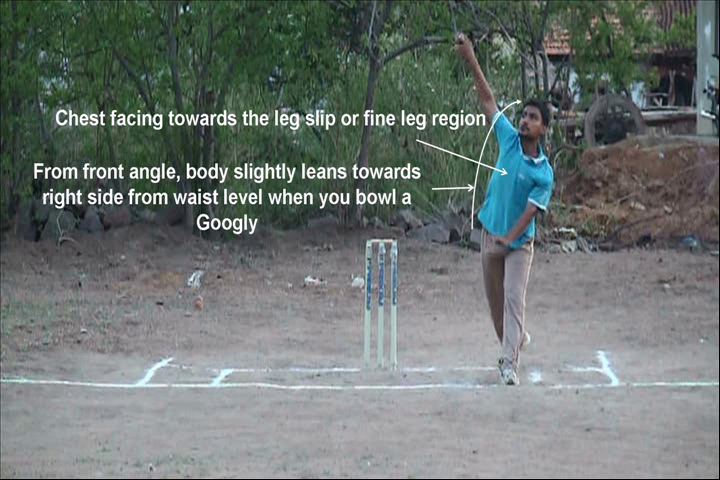 Then the ball rotates in the direction of leg slip region, there by accordingly moves into the batsman after hitting the pitch. And in this type of googly the rotation of the ball will be in the direction of leg slip region with a cross seam or a scrambled seam position but not with a seam up position. 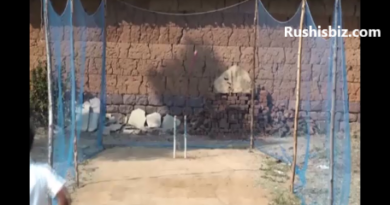 This is how all the depending factors can work together to bowl this kind of googly.